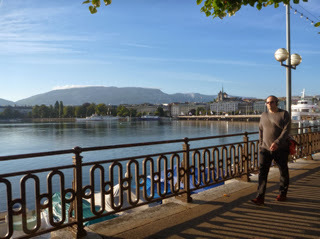 So I decided to have a stopover in Geneva on my way to Mont Blanc, mainly because it was one of those dots on the map that I've always wondered about, and don't get me wrong ... I'm glad that I did. Now, I'd realised in doing this that it would mean I'd be staying in Switzerland (aren't I smart) and hence be operating under a different currency, and I'd covered this by pre booking my accommodation and deciding to eat out on my credit card. What I hadn't realised (which is strange having cycled through Switzerland before) is that they also use a different power plug. What I also didn't realise is how restaurant expensive food is in Switzerland. I wandered down to a steak house and looked at their menu and it was around 40sf ($A50) for a steak. I saw a chinese restaurant down the road and decided that would likely be a cheaper option, but almost hit the floor when I did the maths and realised a sweet and sour chicken with fried rice would have set me back about $A60. That would have to be one good sweet and sour chicken. So being a scrooge, I decided on an early night in bed with some peanuts I had left over from the train and my kindle for entertainment. Being hungry, I was up early the next morning for the quick 10km ride across the border to the French railway station and as soon as I had my ticket to Chamonix I headed to the nearest bakery for a catch up breakfast. Two croissants, a large bread roll and coffee for €4.40 ($A6). It was good to be back in the € zone.